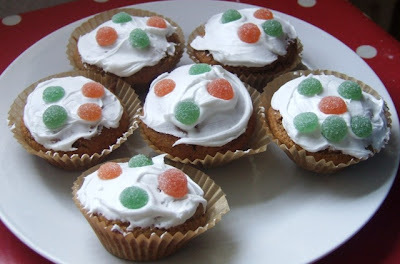 THE HUNGRY VEGGIE: SAINT PATRICK'S DAY VEGAN BUNS! SAINT PATRICK'S DAY VEGAN BUNS! Happy Saint Patrick's Day, everyone!! And here are some festive buns to celebrate our national saint. At home we always called these buns, others called them fairy cakes or queen cakes, and nowadays they are called muffins or cupcakes. Whatever you choose to call them, they are a zesty treat and kids LOVE helping with the decorating, as you can see. I used a mix-with-water Royal icing. Vegan versions available. 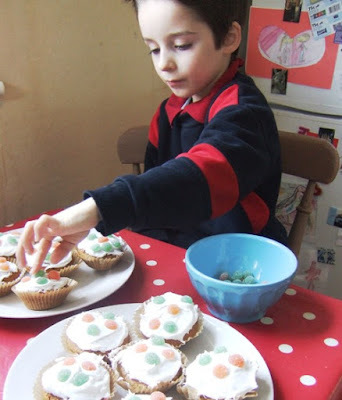 • Leave the buns to cool, then make up the icing (as per pack) and decorate. Leave to set for about half an hour (not in the fridge) and eat! This recipe looks amazing. I can't wait to try these with my little girls. think you should share your recipe with other vegans on RawPeople... they are always happy to hear how other people, esp. across the pond, are doing with their lifestyle. Thanks for stopping by! Happy Paddy's Day. I've already eaten two of these buns today - sugar overload - but they are great. The lemon and OJ worked really well to give a citrusy hit. Yum!